A house in Nantes is being partially constructed by 3D printer, making it the first of its kind in the world destined to be lived in by real residents, and to be built by a robot actually on location. Named Yhnova, the 95m2 house is a project by the local housing group Nantes Métropole Habitat, and the University of Nantes, as reported in French news source FranceInter. 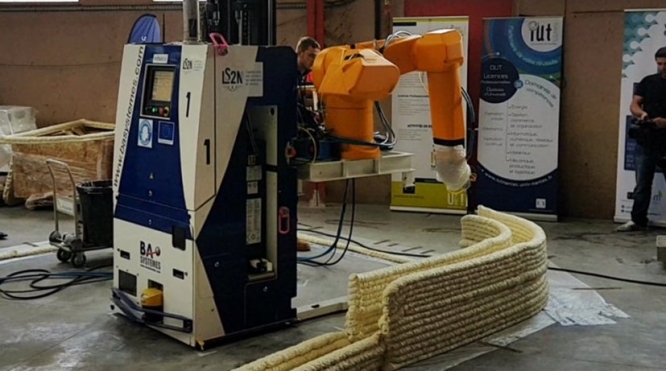 Although 3D printers and other robots have already been used to help build houses in other countries across the world - including in China and Russia - this house is thought to be the first ever to be constructed with 3D printer robots actually at the building site itself. Other projects have simply used 3D printing technology to construct materials offsite, and then brought them to the construction area later. The Nantes project is also the first 3D-printed house destined to actually be lived in by normal residents as their main home, and it will be created to comply with all building standards and livable requirements. The residents are expected to move in within a few months, and, if all goes well, this is hoped to be the first local housing 3D construction of many, within the Nantes Métropole. The 3D-printer robot - named BatiPrint3D - has mainly built up the concrete walls and has even been set to work slower than normal, so that members of the public can watch it at work. The articulated arm of the robot “injects” two polyurethane walls in parallel - which have the appearance of thick layers of meringue - into which liquid concrete is then poured to create a strong wall. Not only is this said to make the house very well-insulated, but it is also expected to cost on average 20% less than a normal construction project of a similar size. The first stage of the building - with which the robot is helping - is also expected to take less than 36 hours to complete, compared to the three weeks it would usually take for humans to achieve the same amount of work. The flexible nature of the robot’s “arm” and the polyurethane material also means that more unusual shapes - including the "Y" of Yhnova - and better insulation can be created.